Sign in to your account below. Thank you for supporting local news. An Air Force veteran Tuesday set himself on fire while "wearing a vest lined with fireworks and flammable devices," officials said in an email. The 58-year old man from Mableton, Ga., had been "disgruntled" with the Veteran Administration system, according to Commissioner Mark McDonough of the Georgia Department of Public Safety. A Georgia State Patrol trooper quickly put out the fire with extinguisher, and the man was transported to a hospital, McDonough said. About 85 percent to 90 percent of the man's body has been burned, according to local reports. Authorities did not identify the man or provide details on why he was unhappy with VA but said he was able to speak during transport. The Atlanta Journal-Constitution reports the man parked his Nissan Sentra on side of the Capitol after 10:30 a.m., walked toward the west entrance of the building and lit himself on fire. The man "doused himself with some kind of flammable liquid," GSP spokesman Mark Perry said. Perry told reporters the vet did not indicate he had additional explosives but officials chose to check the area "out of an abundance of caution." Officials said they do not believe anyone else was injured. Nearby streets have been closed off, and judiciary buildings and the Capitol have been evacuated, according to a local public radio station. Children at the Central Presbyterian church day care were moved by workers to a nearby church, according to AJC. 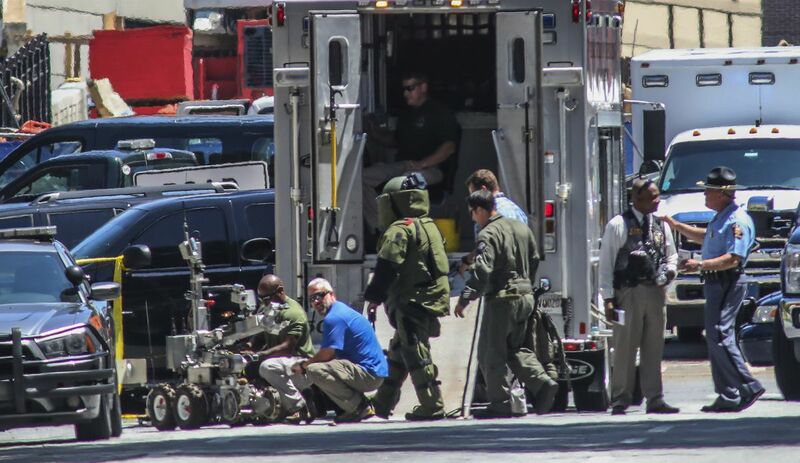 The Bureau of Alcohol, Tobacco, Firearms and Explosives and Atlanta Police are on scene alongside the Georgia Bureau of Investigation who inspected the car using K-9s and a robot, according to local reports. Officials told local news there was a sign in the windshield with a phone number on it. "Please don't call that number," Perry told AJC, fearing it might be connected to another device. The incident occurred in the middle of a news conference about a "hands-free" driving law set to go into effect July 1. Gov. Nathan Deal, R, was not at the Capitol during the fire, according to his spokesman. A spokesman for the U.S. Department of Veterans Affairs told The Post it cannot "comment on the specifics of this Veteran's case due to patient privacy laws, the department is ensuring he receives the VA care that he needs." Officials said they are waiting to notify family members before releasing the name. Support independent, local journalism in Alaska. © 2019 Anchorage Daily News. All rights reserved.